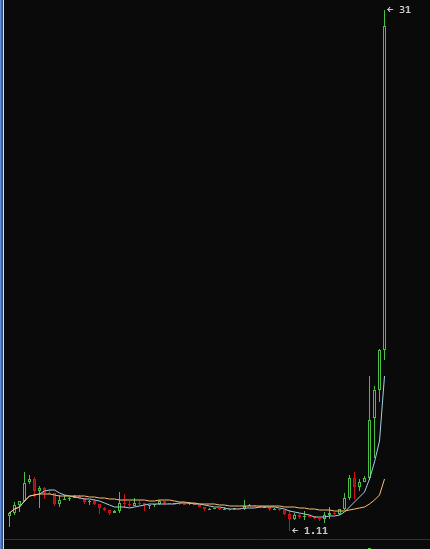 Why is Litecoin going insane? Either markets are completely irrational or there is some development with LTC I'm not aware of. Re: Why is Litecoin going insane? It's a cheaper hedge than Bitcoin. If you are jumping into crypto you will get a better multiplier with litecoin. it's not being spammed unlike bitcoin? LTC is a solid alternative to BTC, especially for those just getting into crypto and looking for higher multiples on the upside. i really don't think there's much more logic to it all, unless, of course, there are some wealthy insiders who have wind of something we don't. Momentum also feeds on itself in the short term, so who knows? What goes up. Must come down. This is blatant manipulation by some Chinese group making even more $$$ as a spin off from the Chinese stock 'crash'. I'd be very nervous now if i were buying LTC. It's Goldman playing the markets with their experimental trading strategy. So far it's yielded 500% returns for them. I understand he is working with approximately 10,000 BTC and gets paid peanuts. Upper management is considering promoting him to handle NYSE trades. yeah i've actually been happy to trade some of my LTC for BTS over the last week. I'm a fan of gradually unwinding positions on the way up; problem is that i tend to miss the big 10x-100x moves that way! Litecoin is still considered the next crypto-currency should Bitcoin run into problems and is also coming up to a block reward halving which could significantly reduce selling pressure. Combined I wouldn't be surprised to see the LiteCoin rally continue strongly. Capital controls this weekend possibly for Greece could be good for all crypto too if it actually happens this time. I believe it's the prospect of Greek capital controls, we witnessed a similar situation after Cryprus, crypto-currencies really took off. In terms of percentage gains LTC & DGC could be the big winners, followed by NXT & possibly PPC etc, then Bitcoin itself. The one's that will increase but benefit the least from the Greece effect would be Ripple, BitShares, Stellar, MaidSafe and Ethereum if it's trading. you are now left with the frustrating situation where vastly inferior blockchains will rise rapidly in value when centralised currencies have problems despite having almost no development and being extremely costly while BitShares, who is literally blowing them away from a development standpoint and cost comparison has to get it's valuation up the hard way through blood, sweat and tears. Litecoin is also popular in China and they are having a big stock market unwind there at the moment, while Bitcoin is also still continually experiencing problems. Either markets are completely irrational or..
was that LTC last year?